Overview Dysphagia, from the Greek dys (difficulty, disordered) and phagia (to eat), refers to the sensation that food is hindered in its passage from the mouth to the stomach. Dysphagia always indicates malfunction of some type in the oropharynx or esophagus, although associated psychiatric disorders can amplify this symptom. Dysphagia affects up to 15% of persons age 65 or older. Dysphagia can be divided into oropharyngeal and esophageal dysphagia, although considerable overlap may occur in certain groups of patients. Oropharyngeal Dysphagia problem with transferring food from the oral cavity into the oesophagus. There is a problem in starting swallowing. Oesophageal Dysphagia problem in transporting food along the oesophagus. Sensation of food getting stuck in the throat after swallowing. Think If a person can swallowing but has a sensation of food getting stuck and has difficulty moving the food down this is oesophageal dysphagia. Next, an attempt should be made to determine whether the patient has difficulty only with solid boluses or with both liquids and solids. Upper and Lower Oesophagus The oesophagus is anatomically divided into three parts (cervical, thoracic, abdominal). However, it can also be divided into the upper two-thirds and lower one-third depending on histology. Upper two-thirds. Stratified squamous epithelial-lined (develops squamous carcinoma), striated skeletal muscle, lymphatic drainage to neck and mediastinal nodes, somatic innervation of sensation (accurate location of level of pathology). Lower third. Transition to columnar epithelium (develops adenocarcinoma), transition to smooth muscle, lymphatic drainage to gastric and para-aortic nodes, visceral innervation (poor localization of pathology). Upper oesophageal sphincter (UOS) = cricopharyngeus. 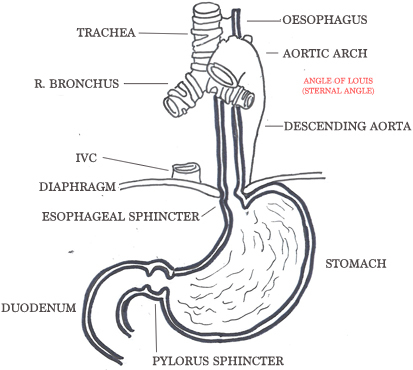 Lower oesophageal sphincter (LOS) = functional zone of high pressure above the gastro-oesophageal junction. Relaxants include alcohol. Remember Swallowing requires intact and coordinated innervation from vagus (UOS, oesophagus, LOS) and intramural myenteric plexus. Motor Neuron Disease (ALS) Amyotrophic lateral sclerosis (ALS) is a degenerative motor neuron disorder of adults. This condition commonly manifests itself in its early stages with dysarthria and dysphagia. These patients classically show progressive debilitation. Myasthenia gravis Neuromuscular dysfunctions can also occur at the level of the neuromuscular junction; such is the case in myasthenia gravis. This is an autoimmune disorder in which antibodies that interact at the neuromuscular end plate are produced. This produces progressive weakness with repetitive muscle use. The most common presentations in the head and neck are ptosis, diplopia, dysarthria, and dysphagia. Oesophageal diverticula (Zenker’s) A pouch, or pocket, of stretched tissue that develops anywhere along the esophagus, pushing outward through its muscular wall. They are rare, and can be congenital or acquired. Typically a single pouch forms, most often near the top of the esophagus; this is called Zenker’s diverticulum. 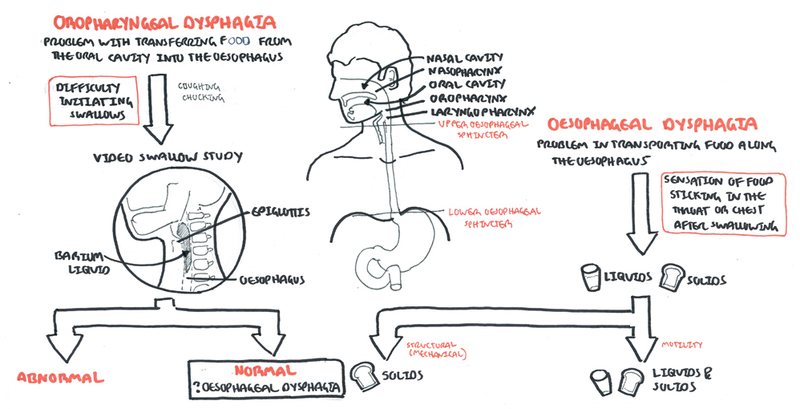 Oesophageal Dysphagia Problem in transporting food along the oesophagus. 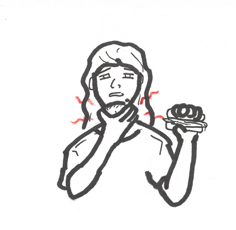 Sensation of food getting stuck in the throat, behind sternum or epigastrium after swallowing. It is then important to identify weather the problem is a motility (neuromusclar) or a mechanical (structural) problem. This is done with solid and water swallowing tests. Motility – both water and solid, spasm or achalasia typically cause chest pain. Achalasia Failure of relaxtion of lower esophagus during swallowing due to degeneration of myenteric plexus (nerves). It is characterized by non-peristaltic contractions in the smooth muscle segment of the esophagus and absent, incomplete, or abnormally timed lower esophageal sphincter relaxation in response to swallowing. Schatzki ring Schatzki rings are fixed anatomic mucosal ring structures in the distal esophagus. They are distinct from lower esophageal muscular rings (A rings), which are transient, smooth, circumferential indentations in the esophagus. Eosinophilic esophagitis Chronic inflammatory disorder of the esophagus and commonly classified as a Th2-type allergy. Barium swallowing – If the study is normal with liquid barium, the examination is repeated after the patient is fed a solid bolus in an attempt to bring out the patient’s symptoms and thereby aid in localizing any pathology. 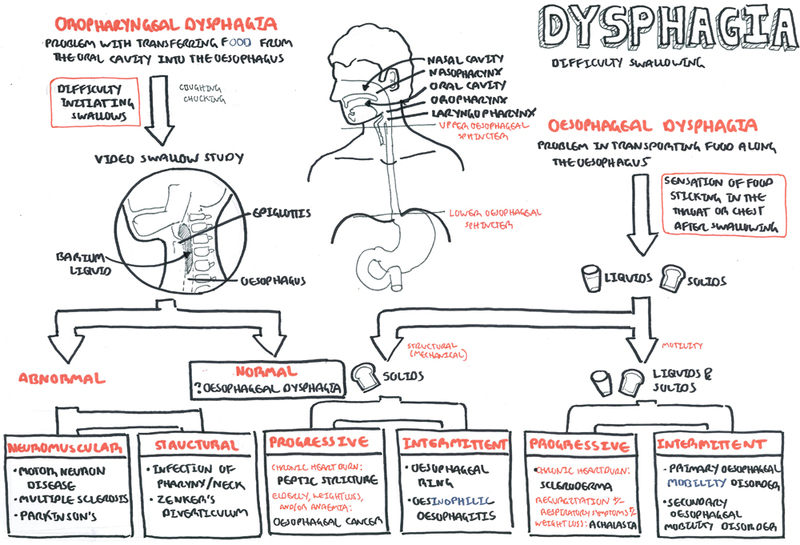 Odynophagia: painful swallowing. Odynophagia may range from a dull retrosternal ache on swallowing to a stabbing pain with radiation to the back so severe the patient cannot eat or even swallow his or her own saliva.